The Andes, which are a geologically young system, were originally uplifted in the Cretaceous and Tertiary periods. They are still rising, causing volcanoes and earthquakes. The Andes are higher than any other mountains except the Himalayas, with many snowcapped peaks over 6700 m high. The following pictures have been taken during an research expedition to the glacier of Mercedario. Click on the links below to view the pictures. We have taken any attempt to provide exact (GPS-based) coordinates of the positions where the photos have been taken. 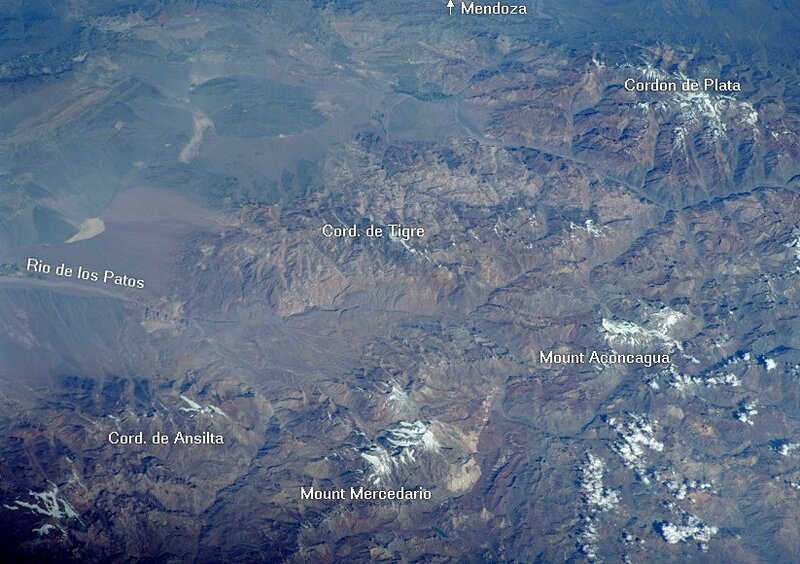 Here you see the Andes around Mount Aconcagua from space.